The following extract comes from The Engineer, February 17th and 24th, 1888 in a long article published over three weeks covering the Stanley Exhibition of Cycles, held in the Royal Aquarium, Westminster. The Stanley Exhibition was an annual exhibition held in London at various venues throughout the late nineteenth century, from about 1876, to promote cycles and cycle accessories. The first of the articles was published on February 10th. “Without doubt the most important feature in this year’s exhibition is the number of machines fitted up for war purposes. Since the successful use of cyclists in the Easter manoeuvres last year a great impetus has been given to the trade, and already one firm – Messrs. Singer and Co. of Coventry – have received a substantial order from the Government for machines for Aldershot, where Tommy Atkins is to try his hand at the most modern means of locomotion. The machines ordered by the Government consist of multicycles and rear-driving safety bicycles. The former, as illustrated by Fig. 16, consists of a series of detachable parts, each consisting of a pair of driving wheels, carrying seats, pedal-crank axles, and driving gears for two riders. Any two parts can be connected together and ridden, or all or any of them can be coupled up as shown in our illustration. (Unfortunately my copy of this illustration is too poor to reproduce.) The advantage, it appears, of this type of machine is that all the riders are kept together, and therefore the pace at which they travel is uniform; whereas with each rider mounted on a separate machine it is extremely difficult to get the several riders to modify their pace as to keep the body of men together, which is so essential in military exercises. In the machine exhibited, which is part of the one ordered for Aldershot, the rifles are mounted in a nearly vertical position, each on one side of the seat, the stock of each resting in a suitable shoe carried by the frame. Between the saddles ammunition cases are carried, while ample room is provided for carrying the riders’ kit. Messrs. Timberlake and Co., of Maidenhead, exhibit a tricycle for four riders, and adapted to carry a Maxim gun over the front wheel. The machine appears suitably adapted to carry a party of four, though we doubt whether the front wheel and its frame is stable enough to support a machine gun in operation. In the rear-driving safety bicycles, which so far have proved most suitable for military purposes when the cycling detachment is used for scouting purposes, the majority of makers elect to carry the rifle longitudinally along the frame of the machine; but there appears to be a diversity of opinion as to the best method of carrying it in that position. Fig. 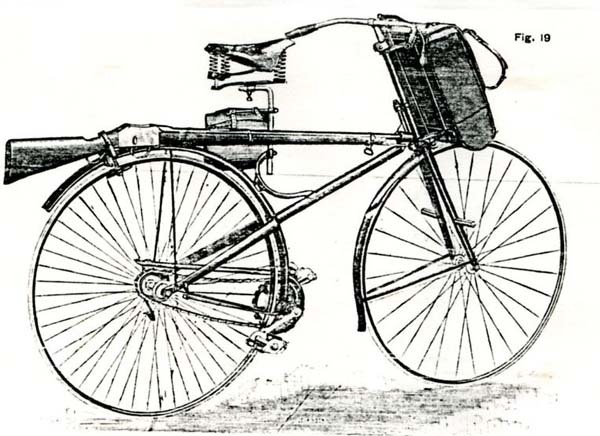 17 illustrates a Humber bicycle with a diamond-shaped frame, showing the method of carrying a rifle on that type of frame. Messrs. Watkins and Co., of Clapton, E., show a most complete military cycle, which is illustrated by Fig. 18. In this machine, a cross frame is used, and the seat pillar is cranked to allow the rifle to be placed exactly over the centre of the machine, so that the balancing thereof is not impeded. On the front of the steering post a new type of signalling lamp is carried on a spring bracket, while a signalling flag is carried by the side of the front fork. Another novel feature of this machine is a strut or support for keeping the machine in an upright position in a state of rest. This strut can be instantly raised or lowered by the rider without dismounting. We believe this device has been applied to this type of bicycle before, but it has never come into general use. It appears, however, to be a sine quo non for military cycles. 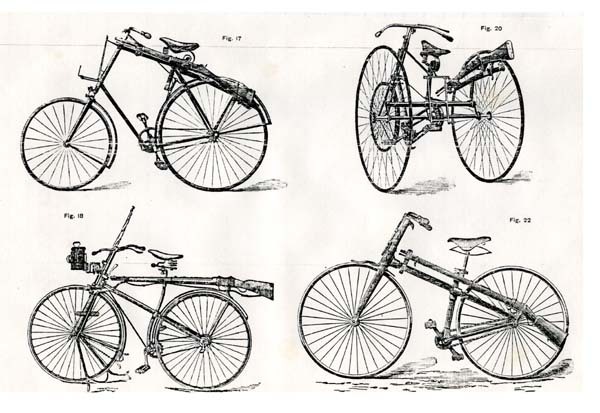 Messrs. Singer and Co., the Coventry Machinists’ Company, and Messrs.Hillman, Herbert and Cooper all exhibit rear-driven safety bicycles adapted to carry a rifle longitudinally thereon, the machine made by the latter firm being illustrated by Fig. 19.
but the Rudge Cycle Company, on their military bicycle, elect to carry the rifle in an approximately vertical position in front of the handlebar – supporting it from one of the prongs of the front fork. 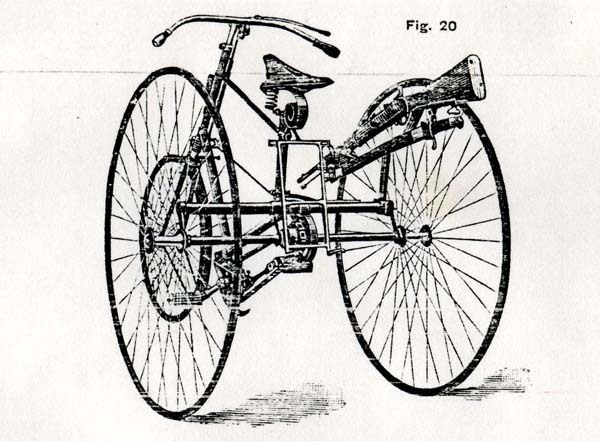 Messrs. Humber and Co. also exhibit a single tricycle of the “Cripper type adapted to carry a rifle; this we illustrate by Fig. 20. Messrs. Wilkins and Co., of Holborn-viaduct, E.C., exhibit one of their “Scout” bicycles, which they claim to be specially suitable for military purposes. In this machine …… the frame carrying the saddle and pedal-crank axle is pivoted at the axle of the driving-wheel, and is supported by springs engaging with the backbone. The pedal-crank axle is a divided one, to allow the position of the rider to be kept well back over the driving-wheel. This materially shortens the wheel base, and makes the machine very easy to handle. Cyclists were used as despatch riders and railway patrols in the Anglo-Boer War in South Africa (1900 – 1902). Following the formation of the Territorial Force in 1908, five existing infantry battalions converted to cyclists, and three new cyclist battalions were formed. During the First World War, in 1915, an Army Cyclist Corps was formed to include the fourteen cyclist battalions which existed by then. In addition, three new battalions were formed. The cyclists tended to be used for reconnaissance but in the conditions existing at the front cycles proved ineffective. Many cyclists were forced to abandon their mounts and immediately following the war the cyclist units were disbanded, or were converted to infantry, artillery and signals units. Most of this note comes from the Land Forces of Britain, the Empire and Commonwealth website, the author of the relevant entry is T.F. Mills.